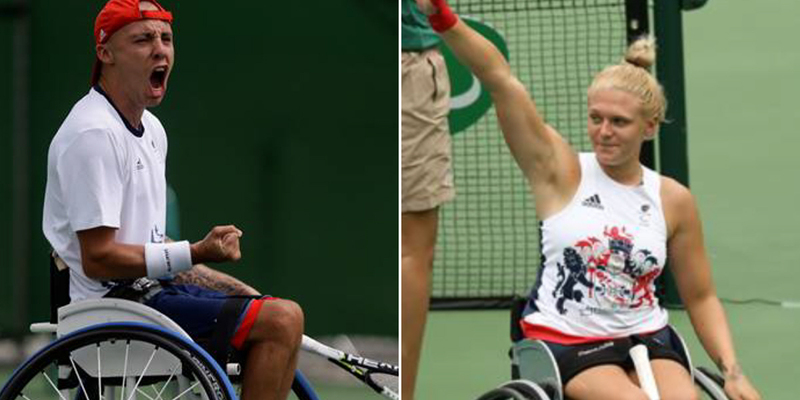 Jordanne Whiley, Mark McCarroll and Andy Lapthorne were all victorious in the Paralympic wheelchair tennis on Saturday while former St. Mary’s University student Toby Gold took silver on the track. Wheelchair racer Gold, the reigning European champion, came second in the T33 100m final in Rio in a time of 17.84 seconds. He was just ahead of fellow Brit Andrew Small, but more than a second behind winner Ahmad Almutairi of Kuwait. Elsewhere on the track, Mo Jomni – who trains in Richmond – failed to qualify from the heats of the T53 400m. In the wheelchair tennis, Whiley – the current US Open singles champion – began her bid for a Paralympic medal with a convincing 6-1 6-2 over Park Ju Youn of Korea. Ickenham-based Whiley, the world number three, needed only 46 minutes to beat 36-year-old Park, who is ranked 12 places below her. She next faces world number 24 Natalia Mayara of Brazil. Whiley’s boyfriend McCarroll teamed up with David Phillipson to beat Dong Shunjiang and Wei Zujun 6-4 7-6 in the first round of the men’s doubles. They will take on the top seeds Stephane Houdet and Nicolas Peifer on Sunday. Lapthorne, from Eastcote, edged closer to a medal by recording his second win in 24 hours. The fourth seed beat world number 21 Heath Davidson of Australia 6-1 6-2 and now faces second seed David Wagner on Monday for a place in the final. Meanwhile, in archery, John Cavanagh, of the Royal Richmond Club, placed ninth in the W1 ranking round.